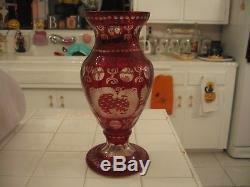 Up for sale is a beautiful vintage Bohemian ruby red cut crystal to clear large tall vase. In great vintage condition with only one small chip on the inside rim that is really hard to see. No other damage that I can see. Measures a tall 12 1/2 inches tall by 6 inches wide with a 5 inch opening. A beautiful vase for any collection. From a smoke free and pet free home. If not happy when you receive your item please contact me and we will resolve the problem, because we want you to be happy! Any questions feel free to ask. The item "Beautiful Vintage Bohemian Ruby Red Cut Crystal to Clear Large Tall Vase" is in sale since Wednesday, October 25, 2017. This item is in the category "Pottery & Glass\Glass\Art Glass\Bohemian/Czech\Other Bohemian/Czech Art Glass". The seller is "jordan23bulls" and is located in Glendale, Arizona. This item can be shipped to United States, Canada, United Kingdom, Denmark, Romania, Slovakia, Bulgaria, Czech republic, Finland, Hungary, Latvia, Lithuania, Malta, Estonia, Australia, Greece, Portugal, Cyprus, Slovenia, Japan, China, Sweden, South Korea, Indonesia, Taiwan, South africa, Thailand, Belgium, France, Hong Kong, Ireland, Netherlands, Poland, Spain, Italy, Germany, Austria, Israel, Mexico, New Zealand, Philippines, Singapore, Switzerland, Norway, Saudi arabia, Ukraine, United arab emirates, Qatar, Kuwait, Bahrain, Croatia, Malaysia, Brazil, Chile, Colombia, Costa rica, Dominican republic, Panama, Trinidad and tobago, Guatemala, El salvador, Honduras, Jamaica, Antigua and barbuda, Aruba, Belize, Dominica, Grenada, Saint kitts and nevis, Saint lucia, Montserrat, Turks and caicos islands, Barbados, Bangladesh, Bermuda, Brunei darussalam, Bolivia, Ecuador, Egypt, French guiana, Guernsey, Gibraltar, Guadeloupe, Iceland, Jersey, Jordan, Cambodia, Cayman islands, Liechtenstein, Sri lanka, Luxembourg, Monaco, Macao, Martinique, Maldives, Nicaragua, Oman, Peru, Pakistan, Paraguay, Reunion, Bahamas, Viet nam.